You've had enough of your cover page? Maybe you want to create a new one from scratch? We'll show you how to get rid of it. The cover page is the home of your brand. It is is your primary access point to all your brand definitions. But what if you have had enough of the cover page? Or you want to create a new one from scratch? 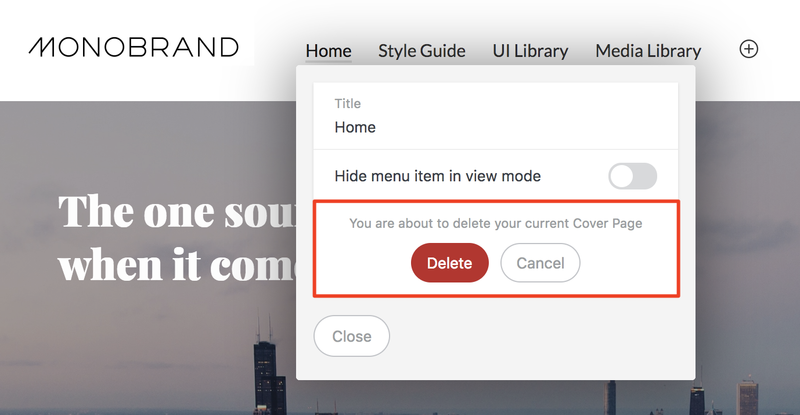 Here we show you how to remove the cover page from your Style Guide. Please note that you have to be Owner of the Style Guide. Just start the edit mode and open the menu besides the Home link. There you will find a button to remove the cover page. To be on the safe side, Frontify asks you if you really want to remove the cover page. Please note that if you have deleted the cover page, we will not be able to undo it. To create a new cover page from scratch, you can simply use the activation button in the Style Guide.